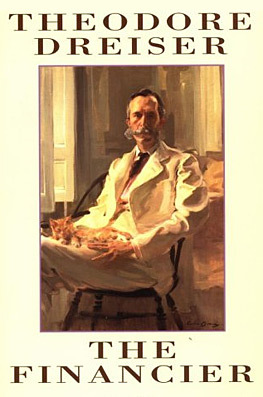 Published in 1912, The Financier, a novel by Theodore Dreiser, is the first volume of the Trilogy of Desire, which includes The Titan (1914) and The Stoic (1947). In Philadelphia, Frank Cowperwood, whose father is a banker, makes his first money by buying cheap soaps on the market and selling it back with profit to a grocer. Later, he gets a job in Henry Waterman & Company, and leaves it for Tighe & Company. He also marries an affluent widow, in spite of his young age. Over the years, he starts embezzling municipal funds. In 1871, the Great Chicago Fire redounds to a stock market crash, prompting him to be bankrupt and exposed. Although he attempts to browbeat his way out of being sentenced to jail by intimidating Mr Stener, politicians from the Republican Party use their influence to use him as a scapegoat for their own corrupt practices. Meanwhile, he has an affair with Aileen Butler, a young girl, subsequent to losing faith in his wife. She vows to wait for him after his jail sentence. Her father, Mr Butler dies; she grows apart from her family. Frank divorces his wife. Sometime after being released, he invests in stocks subsequent to the Panic of 1873, and becomes a millionaire again. He decides to move out of Philadelphia and start a new life in the West. Public domain in the USA, release date: February 26, 2006. 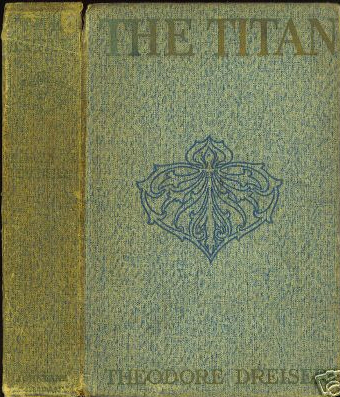 The Titan is a novel written by Theodore Dreiser in 1914. It is Dreiser's sequel to The Financier. Cowperwood moves to Chicago with his new wife Aileen. He decides to take over the street-railway system. He bankrupts several opponents with the help of John J. McKenty and other political allies. Meanwhile, Chicago society finds out about his past in Philadelphia and the couple are no longer invited to dinner parties; after a while, the press turns on him too. Cowperwood is unfaithful many times. Aileen finds out about a certain Rita and beats her up. She gives up on him and has an affair with Polk Lynde, a man of privilege; she eventually loses faith in him. Meanwhile, Cowperwood meets young Berenice Fleming; by the end of the novel, he tells her he loves her and she accepts to live with him. However, the ending is bittersweet as Cowperwood has not managed to obtain the fifty-year franchise for his railway schemes that he wanted. Public domain in the USA, release date: January 1, 2003. 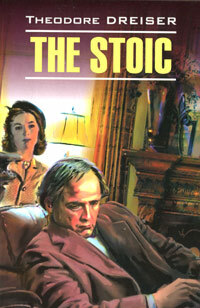 The Stoic is a novel by Theodore Dreiser, first published in 1947. It is the conclusion to A Trilogy of Desire, his series of novels about Frank Cowperwood, a businessman based on the real-life streetcar tycoon Charles Yerkes. Dreiser completed The Stoic only days before his death in 1945 and the book was published posthumously. Cowperwood, still married to his estranged wife Aileen, lives with Berenice. He decides to move to London, England, where he intends to take over and develop the underground railway system. Berenice becomes close to Earl Stane, while he has an affair with Lorna Maris, a relative of his. Meanwhile he tries to fix Aileen up with Tollifer, but she becomes enraged when she finds out it was a ruse. Finally, Cowperwood dies of Bright's disease. His inheritance is squandered in lawsuits. Aileen dies shortly after. Berenice travels to India, where she is moved by poverty. Back in the United States, she realises there is poverty there too, and decides to set up a hospital for the poor, as Cowperwood intended. The Stoic book is probably not in the public domain yet. To protect the Project Gutenberg-tm mission of promoting the free distribution of electronic works, by using or distributing this work (or any other work associated in any way with the phrase "Project Gutenberg"), you agree to comply with all the terms of the Full Project Gutenberg-tm License (available with this file or online at http://www.gutenberg.org/license). 1.F.4. Except for the limited right of replacement or refund set forth in paragraph 1.F.3, this work is provided to you 'AS-IS,' WITH NO OTHER WARRANTIES OF ANY KIND, EXPRESS OR IMPLIED, INCLUDING BUT NOT LIMITED TO WARRANTIES OF MERCHANTIBILITY OR FITNESS FOR ANY PURPOSE. Each eBook is in a subdirectory of the same number as the eBook's eBook number, often in several formats including plain vanilla ASCII, compressed (zipped), HTML and others. * This paragraph, after 1.C., is included only for copyrighted works. For those, you must contact the copyright holder before any non-free use or removal of the Project Gutenberg header.